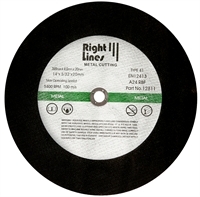 Metal Cutting Discs For Petrol Saws - Higher Speed Rated Wheels. Applications: For use on petrol saws, including the latest generations of higher speed saws made by Stihl and others. For metal cutting. Product Notes: These discs are treble reinforced for increased safety. Always follow safety guidelines supplied with the discs. They comply with EN12413. Max peripheral speed 100m/s giving 300mm (12inch) 6,300rpm or 355mm (14inch) 5,400rpm. Stock: Sorry! We regret that we were caught out by demand and this range is currently sold out. New stock is scheduled for production and we expect to re-stock during May.